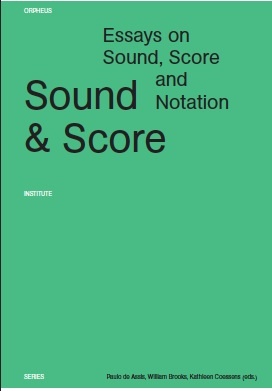 We are glad to announce the launch of Sound & Score–Essays on Sound, Score and Notation, edited by Paulo de Assis, Bill Brooks and Kathleen Coessens. Sound & Score brings together artistic-research expertise from prominent international voices exploring the intimate relations between sound and score, and the artistic possibilities that this relationship yields for performers, composers and listeners. Considering “notation” as the totality of words, signs and symbols encountered on the road to a concrete performance of music, this book aims at embracing different styles and periods in a comprehensive understanding of the complex relations between invisible sound and mute notation, between aural perception and visual representation, between the concreteness of sound and the iconic essence of notation. Three main perspectives structure this volume: a conceptual approach that offers contributions from different fields of enquiry (history, musicology, semiotics), a practical one that takes the skilled body as its point of departure (written by performers), and finally an experimental perspective that challenges state-of-the-art practices, including transdisciplinary approaches in the crossroads to visual arts and dance. Contributions by Virginia Anderson (Experimental Music Catalogue); Paulo de Assis (Orpheus Institute Ghent); Sandeep Bhagwati (Concordia University Montréal); Robin T. Bier (University of York); Maria Calissendorff (Royal College of Music, Stockholm); Miguelangel Clerc (Leiden University); Kathleen Coessens (Vrije Universiteit Brussel & Orpheus Institute Ghent); Jeremy Cox, (European Association of Conservatoires (AEC)); Darla Crispin (Orpheus Research Centre in Music, Ghent); Anne Douglas (Robert Gordon University); Gregorio García Karman (University of Huddersfield); Yolande Harris (Leiden University); Susanne Jaresand (Royal College of Music, Stockholm); Tanja Orning (Norwegian Academy of Music, Oslo); Paul Roberts (Guildhall School of Music and Drama, London); Anna Scott (Leiden University) and Andreas Georg Stascheit (Institute for Advanced Study in the Humanities, Essen/Dortmund).